Celebrating the arrival of a new baby is an occasion everyone enjoys. When a little girl arrives in this world, it's the perfect chance for everyone to show the new arrival and her parents abundant loving support. 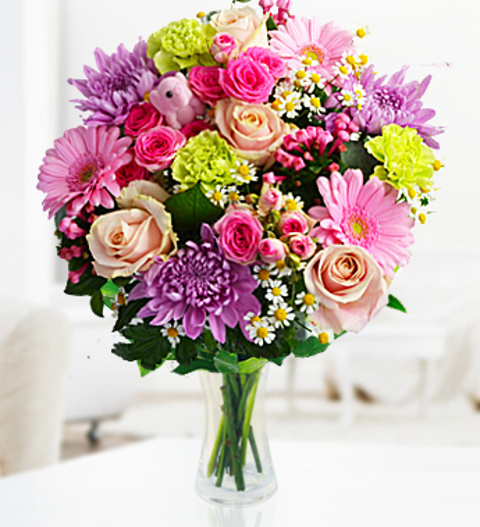 Our New Baby Girl bouquet includes bouvardia, peach roses, spray roses, stallion chrysamthemums, carnations and germinis – all perfectly arranged by our expert florists just for you! Included in the bouquet, you will also find a Pink Baby Elephant pick to serve as an accessory as well as a keepsake. Since babies don't always arrive on the due date, this arrangement is available for next day delivery! Chocolates may contain nuts.